Pittsburgh, Pennsylvania seems a long way for us Pacific Northwesterners to go to find Shade, but I feel rather fortunate because Shade actually found me. 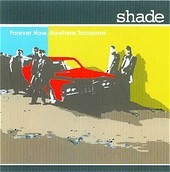 "Forever Now, Nowhere Tomorrow" blows like a cool rock and roll breeze straight out of Pittsburgh and into my mailbox. Starting off with a psychedelic vibe, Shade kicks in gritty guitars and down-home percussion and then takes things down a notch with the bass, keys, and harmonies leading to likely comparisons to bands like Blur, or perhaps Oasis. For Portland, Oregon locals familiar with The Rotating Leslies, Shade opening track, "Hurricane" stirs fond memories of RL's debut cd, "Equipoise". It's nice to hear real guitar and drum music every now and then in a music scene often inundated with studio-processed sounds... and, is that harmonica I hear in the track, "Smile"? I do believe so! Now that is a breath of fresh air. Shade could quite easily be the next dreamy pop band heard on your local "Nu Rock" radio station. I'll spare you the "future's so bright" trivialities, and instead steer you over to CDBaby.com where you can hear a few tracks off Forever Now, Nowhere Tomorrow; such as "Hurricane", "Automatic", "Smile", "Dream Happy", "Spider Rock", and "On My Way".